I have written many tutorials for bloggers on different topics like, creating stylish sitemaps, search bar button, adding Alexa widget and so many others. We know well while adding these widgets we have to edit our template and sometimes if anything is wrong done by us then it damages our website. 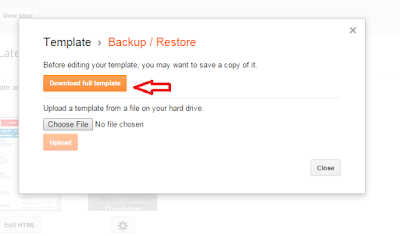 To protect you from damaging your site while editing HTML templates, I am writing today on how to create backup of your layout and templates before start editing of your templates. It is a very easy and interesting process. Suppose, you have totally spoiled your blog with wrong codings then still you can regain your whole website in minutes through backup process. But it will be done only if you take some steps in advance before editing your blog template. 3. Navigate to 'Template' section. 4. Now observe the below given image carefully before start editing. 5. 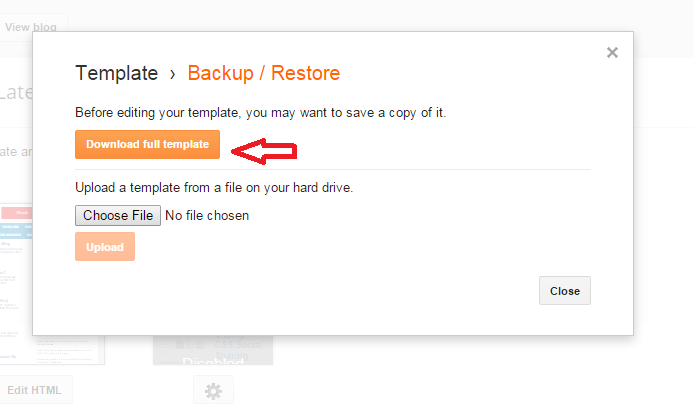 Click on Backup/Restore button. 6. Now download your template. How to regain my older site, if I do some mistakes in my template. Simple, repeat the above given first five steps, then you have to upload your downloaded template instead of downloading. Click on upload. If you face any problem or difficulty, then please don't feel hesitate to ask here. We are here to help you. Message: I hope that you have enjoyed 'Restoring Your Blogger Template is an Easy Process' article. However, if you want me to deliver more items, then please share my post. You can use Social Sharing Widget provided at the end of every post. After all, Sharing is Caring! Really an informative article.Sometimes we need to backup and restore blogger template if there another way to backup blogger template. This is really an informative article. Thanks for sharing. Stay updated with this blog to learn more amazing tips like this.